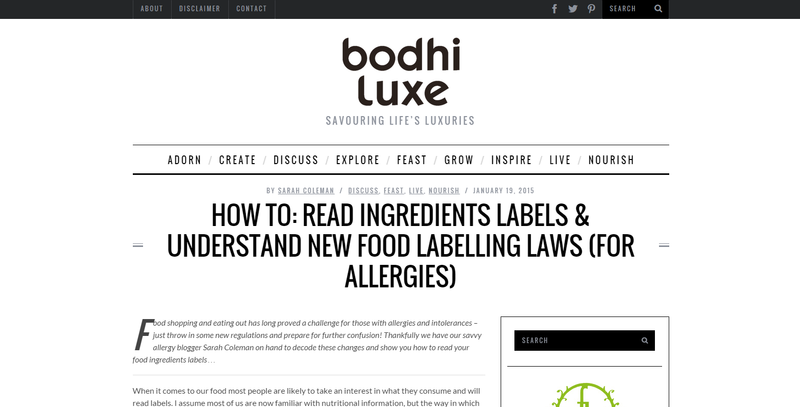 Last week Bodhi Luxe published my article titled "How To Read Ingredients Labels & Understand New Food Labelling Laws" In this post, I am giving a brief overview of the new EU Regulations regarding labelling of food allergens for pre-packaged foods, eating out and food served loose (non-prepackaged). The Bodhi Luxe website has been removed so I have posted my original article below. When it comes to our food most people are likely to take an interest in what they consume and will read labels. I assume most of us are now familiar with nutritional information, but the way in which allergens are identified has recently changed. Companies have been preparing for new EU regulations (‘Food Information for Consumers Regulation (EU) No. 1169/2011′), which have been adopted into UK law and officially came into effect on 13th December 2014. The regulation affects pre-packaged foods, eating out and food served loose (non-prepackaged). There are fourteen major allergens which need to be highlighted: Cereals containing gluten, crustaceans, eggs, fish, peanuts, soybeans, milk, nuts, celery, mustard, sesame, sulphur dioxide, lupin and molluscs. Allergens need to be identified according to these names and emphasised on the label; this could be in bold, italics or underlined. For example, you should see allergens listed as tofu (soya), tahini (sesame seed) and whey powder (milk). A ‘contains X’ allergy statement will no longer be allowed. A ‘may contain’ warning (for cross contamination risks or production methods) is voluntary information which should be taken seriously, yet the new regulations do not control how this information is provided by businesses. When it comes to making consumers aware about gluten, it’s the cereal that needs to be identified e.g. wheat, rye, barley. There are existing regulations for labelling products ‘gluten free’ (a threshold exists and these products must not contain more than 20ppm gluten). If Coeliacs have any questions about food labels, further information is available from Coeliac UK. Another major change affects businesses selling unpackaged foods, such as those sold on market stalls, restaurants or deli counters. These sellers will no longer be allowed to say they do not know if the product contains allergens. However, the new regulations are not asking chefs to specifically cater for allergies or remove allergens from their kitchens, it is simply to provide information which can assist allergic customers to identify safe dishes. Allergen information could be written down on a chalk board or chart, or provided orally by a member of staff. When allergen information is not provided upfront, clear signposting to where this information could be obtained must be provided. If you struggle to obtain the information you require, then report the establishment to your local authority (Trading Standards). The year ahead is going to be an interesting one for food labelling. Old and new styles will co-exist for the time-being until older stocks are depleted. Not everyone has been ‘getting’ the labels and mistakes are being picked up by consumers. If you have any questions The Food Standards Agency (FSA) is your port of call for further information.